Makes 16 servings, 1 piece (93 g) each. Microwave chocolate and butter in small microwaveable bowl on MEDIUM 3 to 4 min. or until butter is melted. Stir until chocolate is completely melted. Cool 5 min. Meanwhile, beat cream cheese and sugar in large bowl with mixer until well blended. Gently stir in Cool Whip and crushed cookies. Place 1 cake layer on plate; spread with cream cheese mixture. Top with remaining cake layer. Spread top with chocolate glaze; let stand 10 min. or until firm. Decorate with icing. Keep refrigerated. 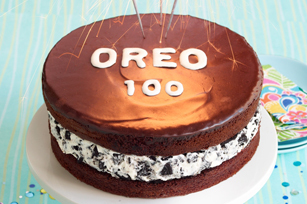 Family FunThis great-tasting cake looks like a giant Oreo Cookie. Cooking Know-HowIf chocolate glaze becomes too thick, microwave on MEDIUM 40 sec. to 1 min. or until desired consistency.